The installation was relatively easy, as is all of our tow hole mounted license plate brackets. Early 2018 Camry SE and XSE models have tow holes on either side, but Andrew elected to offset his license plate to his passenger side. We hand twisted the tow bar in until it tightened all the way through. The length at which the tow bar stuck out was perfect which we were happy to see. This way, the license plate can completely cover the exposed tow hole opening for the most flush appearance. As you can see, re-positioning the front license plate can make a huge difference in how the car looks on the front. With his license plate relocated to the side, Andrew now enjoys a more dynamic front-end look. After the installation was finished, we got to exploring a little bit more of Andrew’s Camry XSE to see what other work he’s done. While the interior seats came out of the factory, we still thought it was a nice touch that added to the overall snazzy presentation. Window vent visors are added for practicality (reduces heavy wind from flowing in), but the dark aesthetic complements the black roof as well. They also match the blacked out trim upgrades in the rear. Andrew added a modest carbon fiber lip spoiler while adding matte black “Camry” letters and TRD badge. He also replaced the standard chrome Toyota emblem with a black logo with red accents. Finally, he smoked out his bumper reflectors to complete the dark trims upgrade for his tail end. We’re not entirely sure, but we think he added matte black exhaust covers. Thanks again to Andrew for coming by our storefront to help us confirm our license plate bracket’s fitment. Check out his group Gen8Kamuri (get it?) on Instagram to see other custom 8th generation Camrys. And finally, see if we have a tow hole adapter license plate relocation kit for your car at store.ijdmtoy.com! 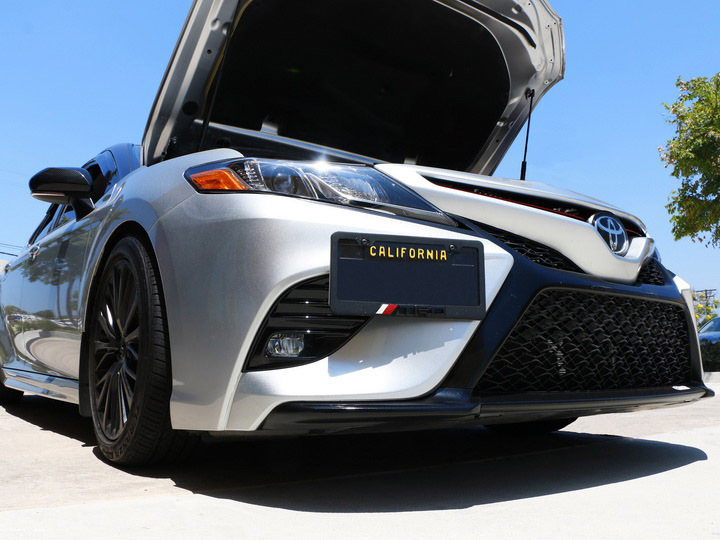 This entry was posted in - LED & HID Updates, Toyota and tagged 2018, Camry, Car LED, car parts, Carbon Fiber, gen8kamuri, iJDMTOY, JDM, license plate bracket, offset, relocation, SE, smoked, sporty, tow hole mount, Toyota, TRD, XSE by Jason T. Bookmark the permalink.